Italian built to the highest standards, the highly respected Admiral yachts of the Italian Sea Group has been building stylish and cutting edge vessels since the mid twentieth century and has launched over 130 vessels to date. 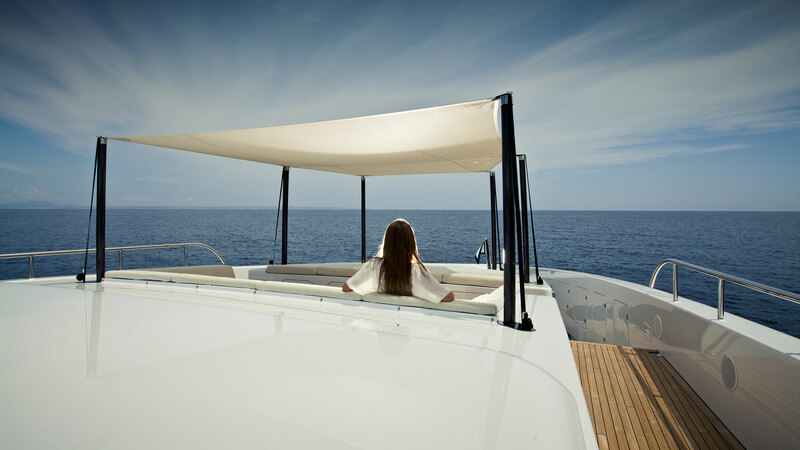 The Italian Sea Group also includes luxury yacht brands such as Tecnomar and Admiral Sail. The combined shipyard facilities add up to over 100,000 square meters of production space which makes it easy to see why today Admiral specializes in the build of mega-yachts up to 150 meters. 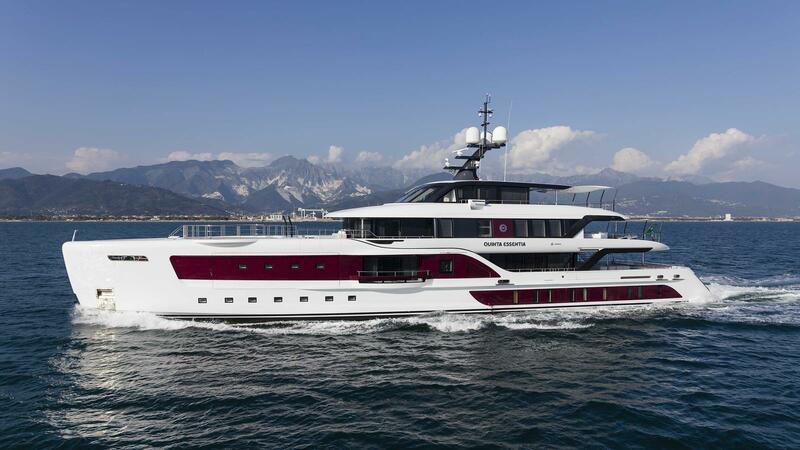 The latest launch in Admiral’s fleet of exceptional craft is its flagship, the 55m (180′) Quinta Essentia. 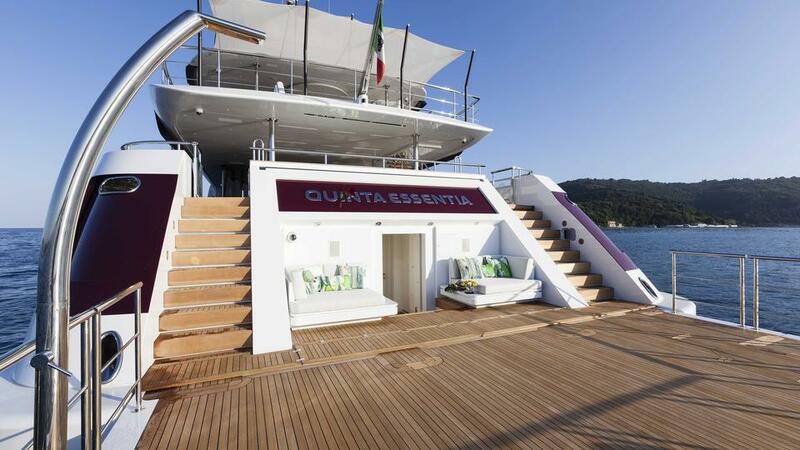 Launched in 2016 Quinta Essentia is a pinnacle of modern engineering and naval architecture. In addition to the beautiful aesthetic lines and red accented hull the vessel combines a number of innovative features such as cutting edge hybrid propulsion and a convertible accommodations plan into her design. Quinta Essentia’s gorgeous exterior lines are the work of Dobroserdov Design and the spectacular interior is the work of Michela Riverberi. She was built with a 4 deck, 6 cabin layout including comfortable accommodations for 12 guests and up to 13 crew. Two of the staterooms on the lower deck and be combined to enlarge them and make it a four stateroom setup if the owner or charter guests desire. This kind of smart accommodations flexibility was made possible by the experienced owners vision for great interior functionality and use of space combined with a top tier builder like Admiral that was able to successfully bring the vision to reality. A few of the on-board amenities include a fully equipped spa as well as a touch-and-go helipad. 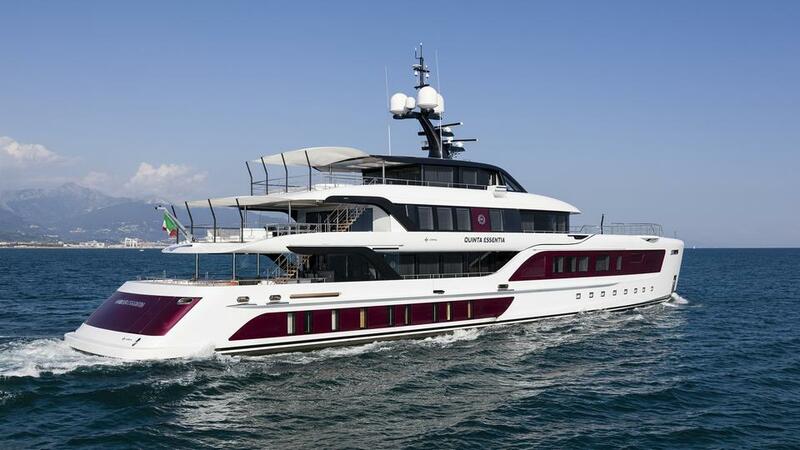 The full displacement aluminum hull and superstructure allow Quinta Essentia to cruise around 15 knots with an astounding range of over 6,000 nautical miles thanks for the innovative hybrid propulsion system. Quinta Essentia represents a combination of cutting edge technology and many years of yachting experience from an owner who knows what works. She is a super-yacht that has earned the right to be a flagship for Admiral yachts and represents the brand’s high standards and quality product extremely well. Keep an eye for new builds on the horizon at Admiral as it has truly set a new standard with Quinta Essentia and there’s no doubt that the tradition of quality will continue.